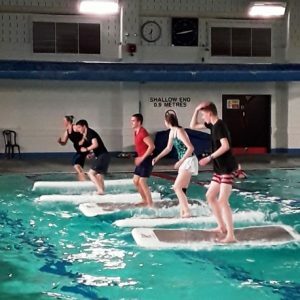 Local people have been taking part in a series of fun and innovative FloatFit sessions at the Geoff Moulder Leisure Centre. The sessions, which have been running four times a week since the end of September, last for around 45 minutes. Those taking part can also have a free swim before or after each session. 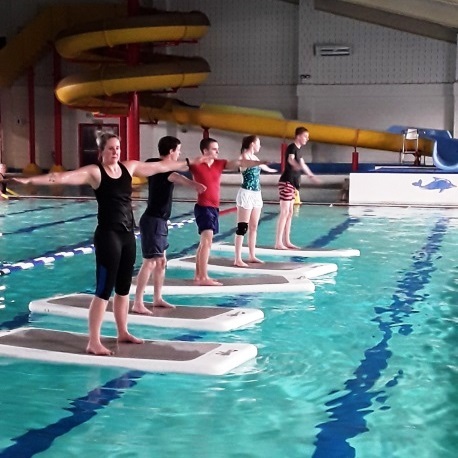 FloatFit is running thanks to Boston Big Local funding which was used to purchase a Platinum Club Package from AquaPhysical which included all of the equipment, training and know-how needed to deliver the FloatFit sessions. Boston Borough Council also provided a training venue and the pool time to enable the sessions to take place. 37 sessions have been run so far in both the daytime and evenings with a total of 249 attendees, 15 of whom were residents of the BBL area. Almost 52% of the people attending the sessions were non-members. So far, over £900 of income has been generated from the Float Fit sessions and this will be used towards the cost of delivering the triathlon events offered for adults and children. To find out more about the FloatFit sessions, visit the Geoff Moulder Leisure Centre’s website. No Comments to "Float yourself fit"